Need reliable WordPress hosting services? Check out Siteground. In order to install the theme you need to have a WordPress copy already installed on your own server. Head to Appearance > Themes. Click the Add New button at the top of the screen and click the Upload Theme button. Upload the leadengine.zip file from your computer and click Install Now. Once you activate LeadEngine, you will see a notification message to install and activate the required & recommended plugins. Install the following required plugins: WPBakery Page Builder, Slider Revolution, Redux Framework, KeyDesign Addon, Contact Form 7 and Breadcrumb NavXT. The WooCommerce plugin is recommended only if you are planning on building a website with eCommerce capabilities. Read more about it here. Make sure you have the Gutenberg editor disabled. More info. Once you have installed the required plugins, proceed with the Demo Contents import. Having trouble trying to install the theme? Please see Cannot upload the theme article. Log into your hosting account via your FTP software client (FileZilla, WinSCP, Transmit or your preferred FTP client). Unzip the leadengine.zip file. Use only the extracted LeadEngine theme folder. 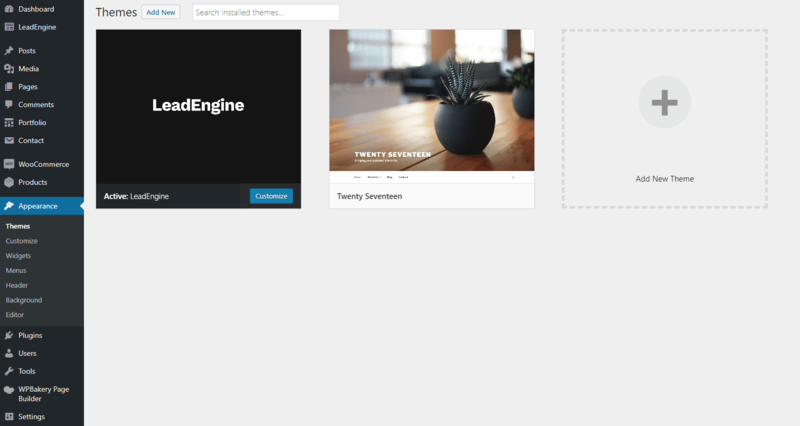 Upload the extracted LeadEngine theme folder into wp-content > themes folder and wait for the upload. Activate the newly installed theme by navigating to Appearance > Themes and clicking the Activate button. Install the following required plugins: WPBakery Page Builder, Slider Revolution, Redux Framework, KeyDesign Addon, Contact Form 7 and Breadcrumb NavXT. The WooCommerce plugin is recommended only if you are planning on building a website with eCommerce capabilities.